A historic Northland church that was deconsecrated and sold to private owners as a result of a dwindling congregation is enjoying a second life. 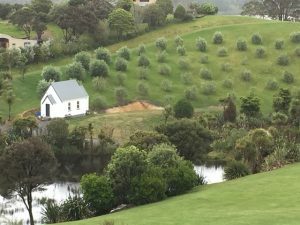 St Francis Xavier Catholic Church, originally built in Kawakawa in 1875, was relocated to Uruti Bay near Russell in 2012 by Jo and Ross Blackman, and has been re-purposed as a wedding venue – now known as ‘Russell Chapel on the Olive Grove’. The heritage significance of the church building was recently reviewed by Heritage New Zealand following its relocation from its original site. The review confirmed its heritage importance, and its listing as a Category 2 historic place. The church had been on Jo and Ross’ radar ever since they began coming up to the Bay of Islands regularly in 1983. “We were driving up to the Bay of Islands one mid-winter’s day in 2012 and I said to Ross as we drove past it, ‘I wonder what’s happening to the little church now as there doesn’t seem to be much sign of it being used, and it’s looking rather sad and run down,” says Jo. After a bit of research about ownership, the couple made contact with representatives of the Catholic Church about buying the building, and subsequently Quin Turton of Kawakawa who was acting as caretaker for the building. Quin also provided some information on relocating the church. “We moved the church on the back of a house moving truck, which we then floated across the Waikare inlet on the Opua car Ferry, and then on by road to Uruti Bay,” says Jo. A final farewell service was held in Kawakawa before it was moved, and another welcome and blessing for the church was held at its new site. St Francis Xavier Church was used for more than 130 years during its time in Kawakawa and has historical significance reflecting European settlement in Northland in the mid-to-late 19th Century according to Heritage New Zealand’s Northland Manager, Bill Edwards. “Like many other historic churches in Northland and around the country, falling congregation numbers have raised questions about how viable these buildings are long term. This is an example of an historic church that’s still continuing to serve the community – though in a different guise,” he says. St Francis Xavier Church was once the religious and social focal point for a large population of Catholic Irish miners who worked in the local coal mines, and who had made Kawakawa their home. “So strong was the Irish community that the settlement was often called ‘Irishtown’,” says Bill. Discovered in 1861, Kawakawa’s coal was found to be high quality, and was excellent for both steam and gas making. The town of Kawakawa was built around coal, and in 1868 a rudimentary railway was constructed carrying coal from the mine to the nearby Taumarere Wharf and Landing – the first railway in the North Island. “With Kawakawa’s rapid population growth there was a growing need for a church to meet the spiritual needs of the people, and in December 1875 the church was built and consecrated,” says Bill. The Blackman’s have worked to retain the original character and heritage values of the building – including its solid kauri interior – by keeping the interior minimal and letting the building speak for itself. “The church’s lines are simple and clean and you can almost feel the presence of the Irish miners who built it all those years ago,” says Jo. According to Bill, it’s generally preferable for historic buildings to remain on their original sites so that they retain their sense of context within a wider heritage landscape. “In some cases, however, relocation can be an alternative – particularly if it means that there is a danger the building could be lost forever if it isn’t moved,” he says.